After running the Mass Student Scheduler the following reports can help identify conflicts. Search for any of the reports by typing their name into the main search bar. This page provides high level info about the schedule - percentage of requests fulfilled, percentage of schedules completed, and more. This provides you an overall view of the master schedule and allow you to make direct changes to the master schedule. 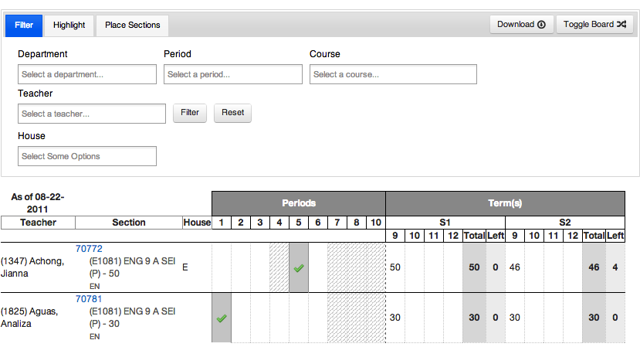 You can change sections, create sections, filter courses/depts/teachers, and much more. Additionally, you can also move students out of classes and mass move students to other sections. 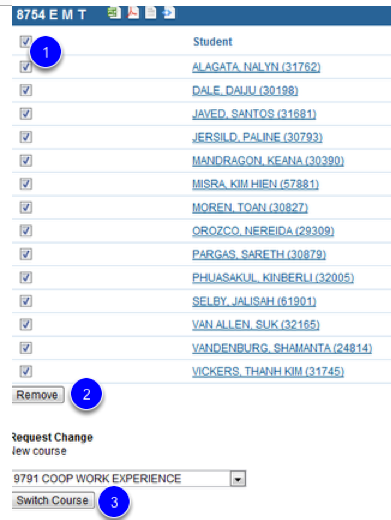 To edit a section simply click on the blue section ID number. 1. The section ID number is a link, and clicking it will lead you to section information that you may (i.e., at that point) edit. Course Request Details - to review the complete list of course requests by students and see which have been fulfilled. Click on column headers for easy filtering. To view students who are missing a class/period. An 'X' indicates a missing period/timeblock. Use the filters at the top of the report to control the list. Click on the student's ID number to navigate to the Draft Student Schedule page to make corrections. This report shows the number of sections assigned per student as well as the number of course requests that were unsatisfied. Click on the headers for easy sorting. 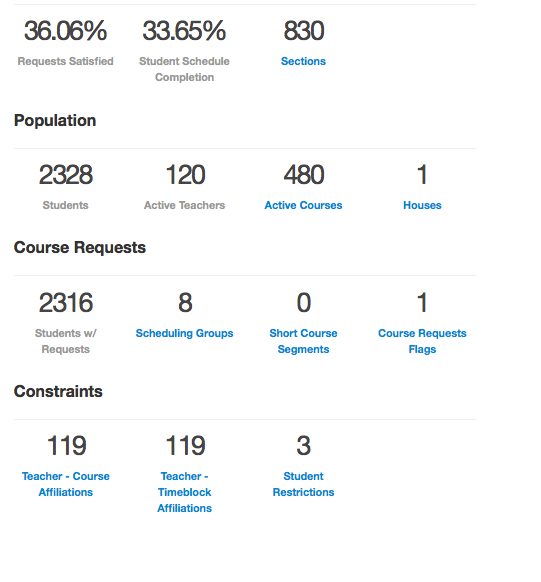 Sort by "Total Requests Unsatisfied" to easily identify students with unsatisfied course requests then click on the student ID number to quickly navigate to a student's Draft Schedule.